MOSCOW (Sputnik) - A rally organized by Rossiya Segodnya International Information Agency to protest the detention of head of the RIA Novosti Ukraine news portal Kirill Vyshinsky, who has already spent nearly six months in custody in Ukraine on suspicion of treason, took place outside the Ukrainian Embassy in Moscow on November 2. 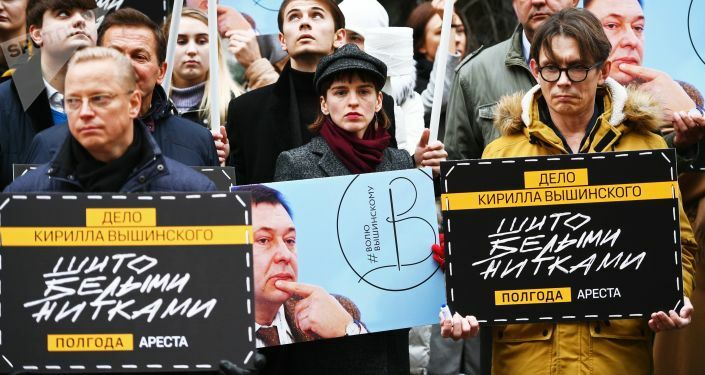 About 100 people, including famous journalists, State Duma lawmakers, human rights activists and colleagues who are not indifferent to Vyshinsky's fate, took part in the demonstration. RT and Sputnik Editor-in-Chief Margarita Simonyan and Rossiya Segodnya Director General Dmitry Kiselev also were among those present. Participants in the rally chanted "Free Kirill Vyshinsky!" and carried portraits of Kirill with the same hashtag. The event was timed to coincide with the International Day to End Impunity for Crimes against Journalists, observed annually on November 2. — Sputnik Insight (@Sputnik_Insight) 2 ноября 2018 г. The day was proclaimed by the UN General Assembly resolution that condemns any violence against journalists. The document urges member states to "do their utmost to prevent violence against journalists and media workers, to ensure accountability through the conduct of impartial, speedy and effective investigations into all alleged violence against journalists and media workers falling within their jurisdiction and to bring the perpetrators of such crimes to justice and ensure that victims have access to appropriate remedies." "Kirill Vyshinsky was arrested solely for fulfilling his professional duties – he covered the events, expressed his assessment of these events in order to convey the truth to those who want to know what is happening in Ukraine under conditions where there is a media space cleaned of any Russian media," Russian Foreign Minister Sergei Lavrov told a press conference after talks with OSCE Secretary General Thomas Greminger. The diplomat stressed that the reaction of OSCE Representative on Freedom of the Media Harlem Desir varied when it came to violations of the rights of Western and Russian journalists. "We drew the attention of our colleagues from the OSCE to the fact that the OSCE's special representative on freedom of the media responds differently to different cases of violation of the rights of journalists, and we have handed over a comparative table including Mr. Dezir's statements expressing negative attitude to violations of the rights of Russian journalists and violations of the rights of journalists from other countries," Lavrov said, urging the organization to avoid double standards. Vyshinsky was detained in Kiev on May 15 on suspicion of supporting the breakaway republics of Donbas and on treason charges. The maximum penalty for such an offense is 15 years of imprisonment. On May 17, a court of the southern Ukrainian city of Kherson ruled to remand Vyshinsky in custody. The defense appealed the arrest, but the court dismissed the appeal. During a court hearing, Vyshinsky asked for help from Russian President Vladimir Putin. He also said that he would give up his Ukrainian citizenship. Putin has said that Vyshinsky's arrest was politically motivated, adding that the incident demonstrated an unprecedented and unacceptable policy of Ukrainian authorities targeting journalists who were just doing their jobs. The Russian Foreign Ministry lodged protests to Kiev, calling on it to stop the crackdown on media. 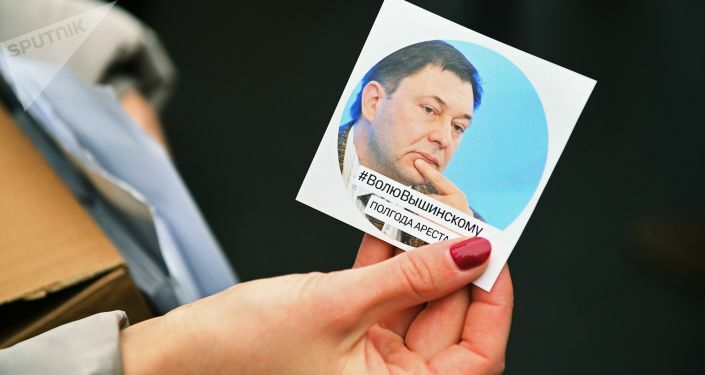 On November 1, the Kherson city court extended the arrest of Vyshinsky until December 28.